I’d say it’s pretty apropos that today is National Cuddle Up Day, given that in most of the U.S., the temperatures have plummeted to ridiculous lows. Here in New York City, we’re expected to have a low of -8 tonight, officially ruining the day of everyone tricked by the warm 49 degree morning that melted away most of the weekend’s winter storm. The good news about cold weather is that it’s really the best excuse to drink tasty warm cocktails. Of course, there’s hot buttered rum, mulled wine or cider, a good old Irish coffee, or if you’ve got some friends or a whole lot of roommates, crock pot cocktails, but I think the best way to warm away all the cold weather is a midwestern favorite of mine – The Tom and Jerry. The Tom and Jerry has nothing to do with the beloved cartoon cat and mouse, and it’s not a vague reference to the cocktail king of old, Jerry Thomas. The name is taken from a book written by Pierce Egan, Life in London, or The Day and Night Scenes of Jerry Hawthorn Esq. and his Elegant Friend Corinthian Tom , and the subsequent stage play Tom and Jerry, or Life in London. The drink itself was invented to promote the play. 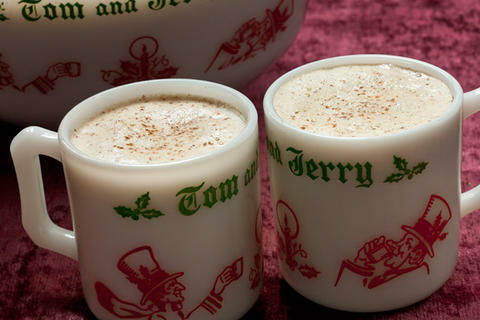 Similar to homemade eggnog, the Tom and Jerry is quite popular in Wisconsin and Minnesota, and you might be hard pressed to find anyone who knows what it is outside this region. This is only a problem if you have no interest in making your own batter, or if you don’t drink cocktails of which you’ve never heard. For those of you who have some time or a grocery store that carries ready-made batter, let’s get started, shall we? Beat the egg yolks well, then gradually whisk in the sugar. Add the rum and spices. In a separate bowl, beat the egg whites until stiff and fold into the yolk mixture until well mixed. Keep batter refrigerated until serving. For each drink, put 2 ounces of batter into a mug. Add 1 oz each of brandy and aged rum, and fill with equal parts hot milk and boiling water. Top with grated nutmeg. If using a small coffee cup or classic Tom & Jerry mug, you can cut the serving size in half. Serve with a spoon. Just a note: While this recipe is for making your own Tom & Jerry mix, in case you have no time or no urge to make it, frozen batter can be found in bakeries or the dairy coolers at grocery stores, in liquor stores or on the internet. Previous On the twelfth day of Christmas, Drink Matron gave to me: Christmas cookie cocktails!